It turns out that Cliff's love of music runs in the family. 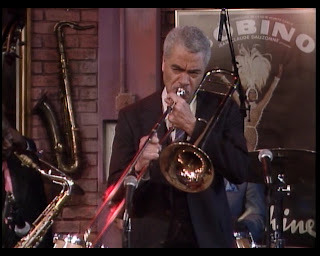 Russell used to be a jazz trombone player, and when his old band gets together to jam, he wants to be part of the action. Unfortunately, he's gotten rusty over the years, and this week the family gathers first to craft a scheme that will kick his rehearsing into high gear, and then to celebrate his triumphant performance. 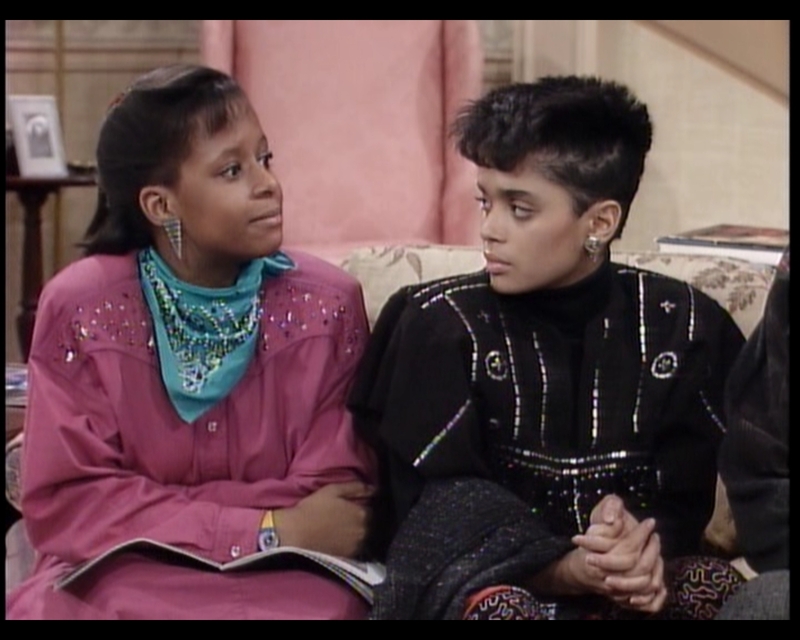 And if someone's giving a concert, you know the Huxtables are dressing up. Get ready. 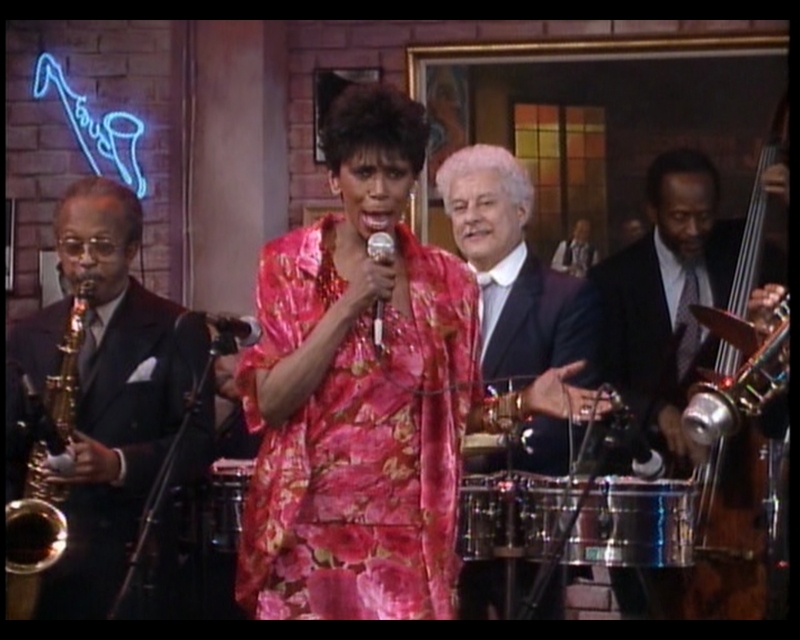 The little-known spin-off in which Florence from The Jeffersons has a stand-up career. There are a number of band members, all wearing various suits, on whom I won't spend time. 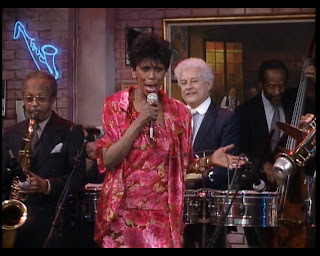 I will, however, mention the lead performer, Ms. Josephine Premice. 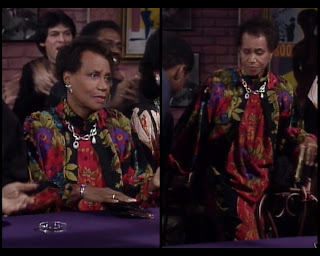 An accomplished singer, dancer, and actor, she was also a well-known socialite who was, ironically given her attire here, known for her fashion sense and elegance. After several Broadway roles (including two Tony nominations), she made the move to television in the 80s, including The Cosby Show and A Different World. 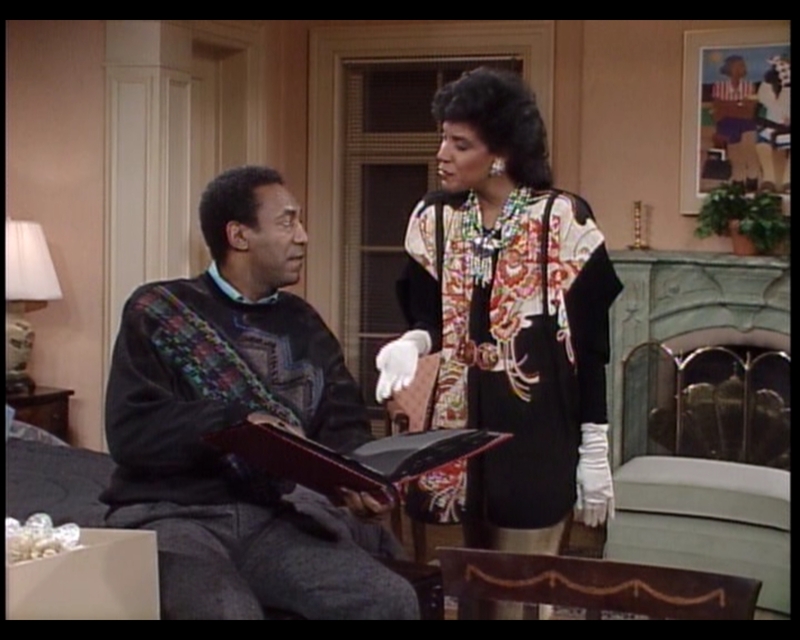 Her costume here is garish for a reason: she's playing Mrs. Cunningham, who Anna Huxtable dislikes intensely. This woman is, as scripted, a terrible singer, a worse dancer, and something of a social clod. Premice's casting is thus an in-joke for those aware of her reputation. Similarly, her clothes here are not meant to flatter, but to broadcast her unappealing qualities. The outfit grabs attention in all the wrong ways. A print this bold should never be on three pieces worn together. The shimmer makes the colors more garish and highlights how poorly the sickly green leaves match the fuchsia roses with which they're paired. Though obscured by the microphone in this shot, there's also a cascade of sparkles on the front of her top, adding more bling to an ensemble that doesn't need the help. The look delivers a clear message, so while not a triumph of style, it's a victory of storytelling. This first outfit is interesting because it's actually all repeats, just put together differently. The red plaid shirt comes from episode #2.03, the diamond-patterned sweater is from #1.22, and the blazer and pants come from #1.14. 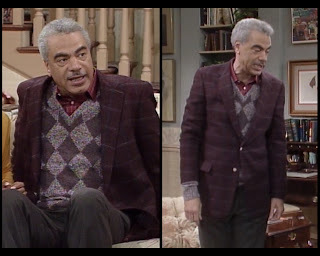 I adore the way that the new surroundings bring out the redder undertones of that sweater, and in general I'm pleased by the way his selections here reflect the reality of how people wear clothes. You don't have a new outfit every day; you have a bunch of individual garments that you try to get mileage out of by combining them creatively. He looks sharp here, and the hues are a symphony. Fabulous. 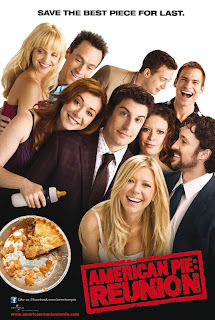 Jason Biggs is hardly a style icon, but it's still an interesting overlap. No, I will not make a bone joke. This man is Panthro, for heaven's sake. RESPECT. 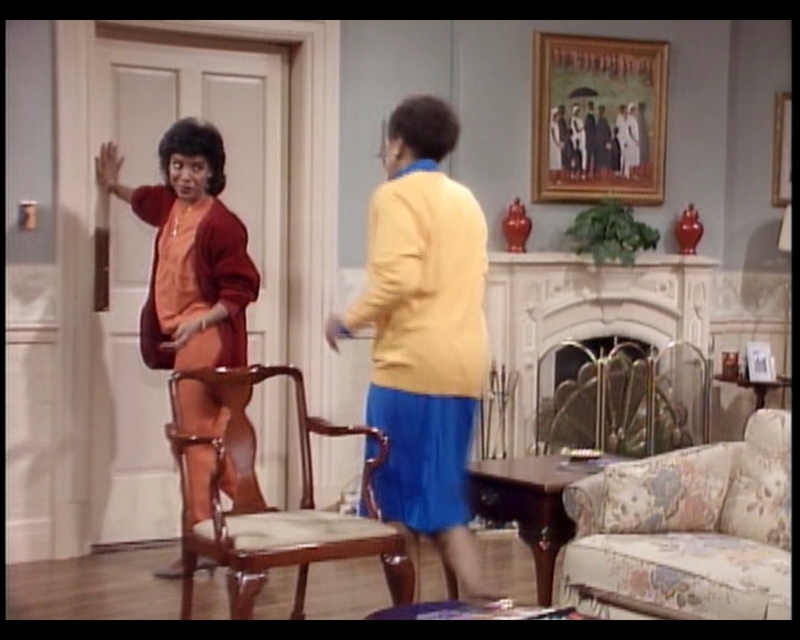 In his second appearance, we see Russell at home. It's interesting to catch him at a more relaxed moment, because his look veers much more traditionally into old man territory. The loose cardigan and high-slung pants in particular broadcast his age. While it's similar to yesterday's shirt, this one seems decidedly more workmanlike with its larger, less refined plaid and two prominent pockets. The sweater over it takes some good chances, though. Since the tonal range stays pretty dark and muddy, he can kick it up with the pattern, pairing those burgundy checkers with the contrasting blue slashes. It's a creative piece that I think could look good in other settings as well. The pants, if worn a smidge lower, would probably be fine. 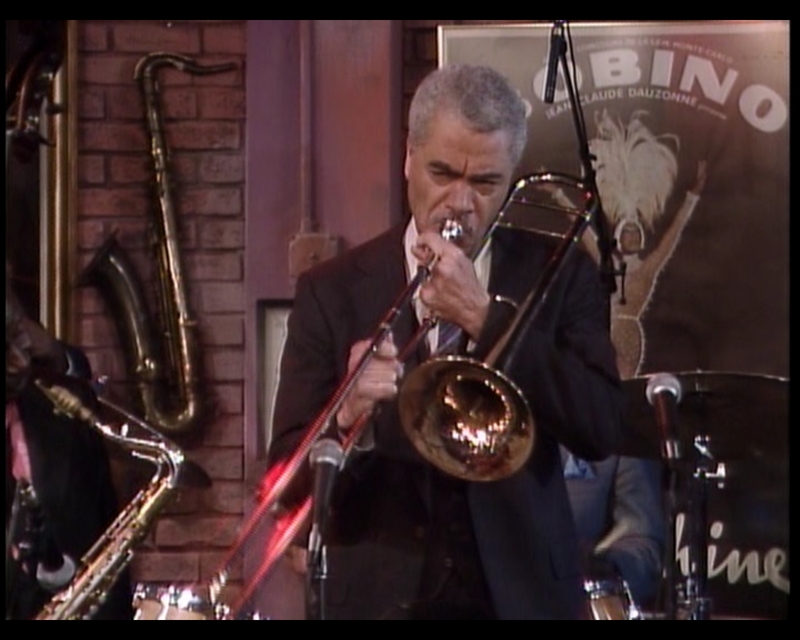 But again, he's just at home practicing his trombone, so I don't need to see him at his best. How much Viagra did it take to- NO! I said I wouldn't, and I won't. For the performance itself, he wears a suit. I've talked enough about suits in this blog, probably. To critique one properly, you need a pretty close read on the tailoring and other details, and the show just isn't set up as a showcase for fashion minutiae, even when I try to force it in that direction. Not sure why this is where I'm drawing the line in terms of blatant speculation and guesswork, but it is. Grandma throws a ton of shade. I'm impressed with Anna's first look. Her color choices are pretty assertive: cobalt and goldenrod need to be worn with confidence, especially when there's so much of them being tossed about. There's nothing to break them up, either: it's just all pigment, all the time. I wouldn't have thought the combination would work so well, but it truly does. Despite the risk, she also manages to keep conservative with the styling: there's a lot of coverage, and the fit is relaxed but not slovenly. 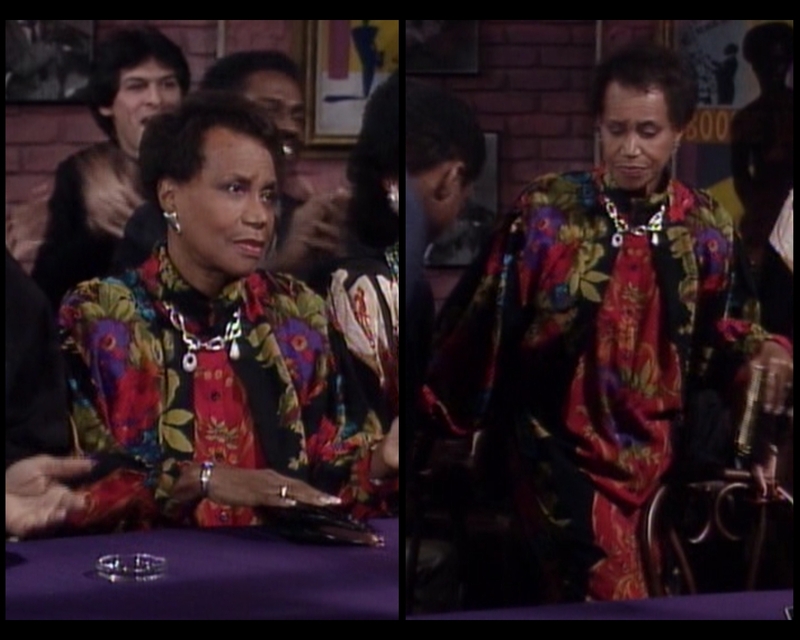 Especially applause-worthy is the low opening on her cardigan; that shape is so chic. 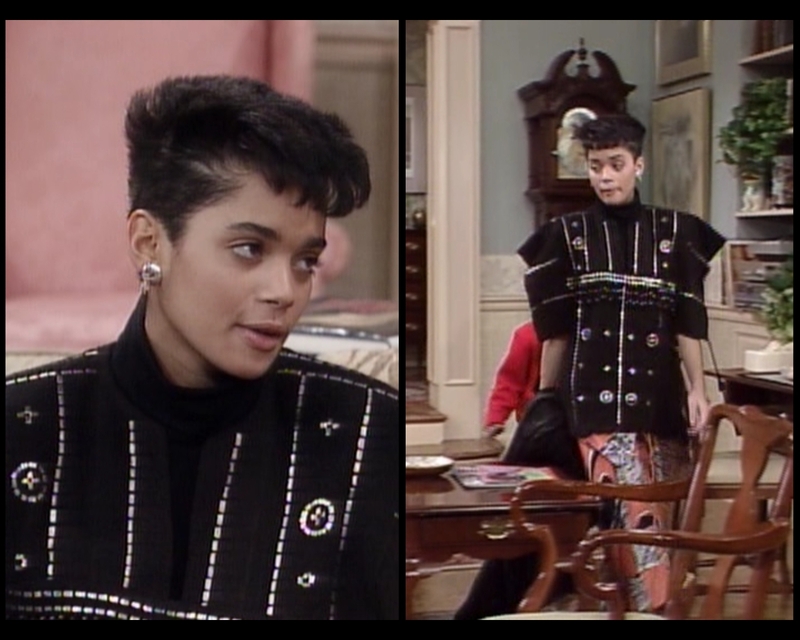 Also, notice the buttons on her mock turtleneck. Flourishes like that are great if you're dealing with mostly flat tones. To me, this is a stellar around-town outfit: it's not particularly dressy, but it's still eye-catching and balances well between playful and put together. No, really. She's serving pretty consistent stank. At home, her game is a little off. The pants are delicious: big and luxurious, not your average khaki, totally lovely. That burnt cantaloupe color is mirrored in the sweater's patterns, which I also like. And honestly, this away-from-the-body silhouette works in a lot of situations. The real problem is the design of the sweater itself. The shades don't come together pleasingly; rather, they seem to be fighting among themselves. The complicated geometry is also a little much. It feels overdone, and a simpler pattern would probably have made this another slam dunk. Tough to tell, but I bet she's throwing down a scowl here, too. See what I mean? From behind, the sweater is a whole different animal, and it's so much better. Look at that face. Told you she didn't like Mrs. Cunningham. Anna works some glamour for her husband's performance, with mixed results. Whereas her first dress had just the right amount of give, this one gets a little further into sack territory. I like that it's patterned, but I don't know that I like its pattern against the design on the cape. The colors match, but the effect becomes little frantic. The eye doesn't know where to focus. The cape itself is a vision, however, and I won't say a word against it. The floral shoulders against the black background create a regal air that is cemented by the thick silver clasp. I'd just advise her to switch that frock out for something a little calmer. She was once again close to success here, but missed by a hair. He might be performing some sort of psychological test on people with this shirt. It never dawned on me that a piece of clothing other than a sweater could be Cosby-ized, but this right here is so obviously a Cosby shirt. It's tough for me to count just how many fabrics are at play, but it's an inspired mess if ever there was one. The colors, shockingly, all work alright together: the white and yellow provide some bright spots, but there aren't a lot of pastels or neons or lowlights to throw you off. At the same time, it can't be said that it coheres. You're aware when you see this that you are seeing several items spliced like a mad scientist's diabolical experiment. While it's creative and fun, it's not whole, for lack of a better word. I don't think the garment exceeds the sum of its parts. He is trying to disorient us with illogical combinations of fabric and strings of meaningless syllables. This view gives us a better look. You've already seen the back with its mottled, TV static situation. On the front, there are several diagonal servings of color story for you to consume. My favorite is the subtle border between the blue checkers and the disorderly conduct taking over his left side. I'm unimpressed with the fit, though: he's ballooning up everywhere. His confidence is stellar; the outfit itself isn't my cup of tea. 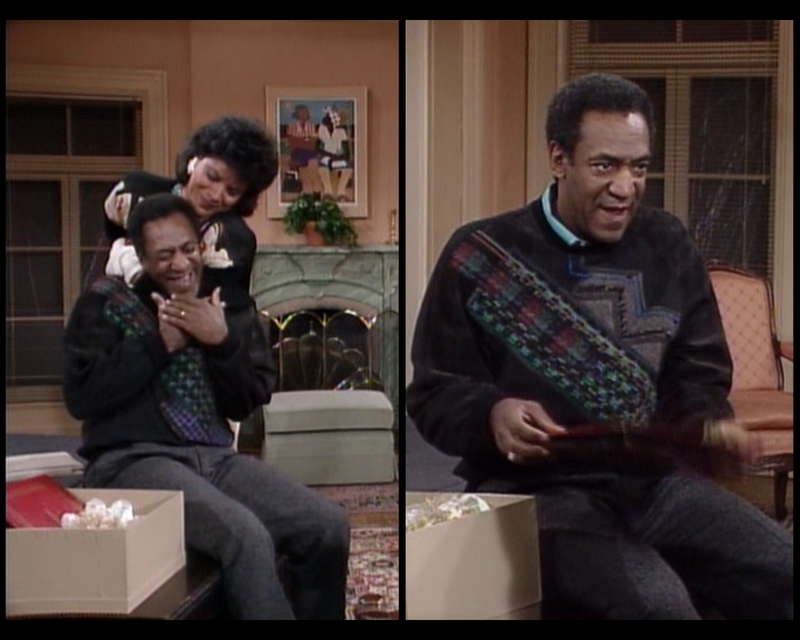 Cliff's concert look is a sweater that is standard for him, though outlandish by any sane criteria. It looks like the crazy train ran him over. He's begun showing an affinity for this diagonal bisection of the torso, which continues to make appearances. 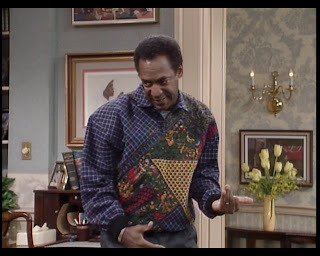 Much of my critique from the previous outfit applies: it's another hodgepodge that only works because we've come to accept, after decades of exposure, that this is how Cliff Huxtable ought to look. 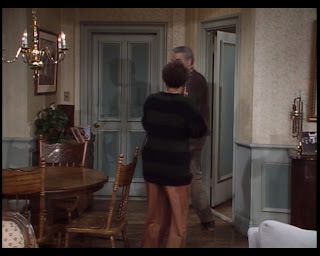 I included the shot of him in the headlock because it's worth noting that the blue fabric with white crosshatching that makes up the majority of his first shirt is also included near the bottom of this sweater. The photo album covers it in most shots, but it's there. So we know that if this wasn't built for scratch especially for him, it was at least customized. It's just neat, is all. You can seek more information, but you will never comprehend. It's worth taking a closer look just so you can understand how much is going on: there are patterns within patterns, textures within textures... even the part that looks like it's flat black seems kind of striped at this proximity. It's so intricate that you almost shouldn't get this kind of detail. You're better off not knowing. It always pains me when I have to question her selections. Clair and I are having a disagreement as to whether this is a real outfit. She's tried to fool me by putting a seam across her bosom, but I'm not sure I can call this anything other than a sweatsuit. I almost didn't post pictures of it, but she's trying so hard to make it happen: the locket, the earrings... she's even wearing little heels! "Quick! In here, before someone tries to add detailing or interest to our unbroken walls of color!" They're maybe an inch tall, but they're heels. Well, if it is an outfit, then it's a bad one: the fit is weird (look at her midsection in the shot above) and the palette isn't great. She can do, and has done, significantly better. She doesn't need my reassurance. She's self-satisfied. Clair has been serving a lot of big accessories lately, and I'm completely on board with that decision. She radiates this regal, assured quality in everything she does, and thus has the demeanor needed to carry off statement pieces. She has a directness that makes you doubt your own assessment of her clothes. "I mean, I thought the top was kind of weird, and I wouldn't have been into the whole paneled tapestry thing myself, but she's working it so fiercely that I guess I must be wrong." 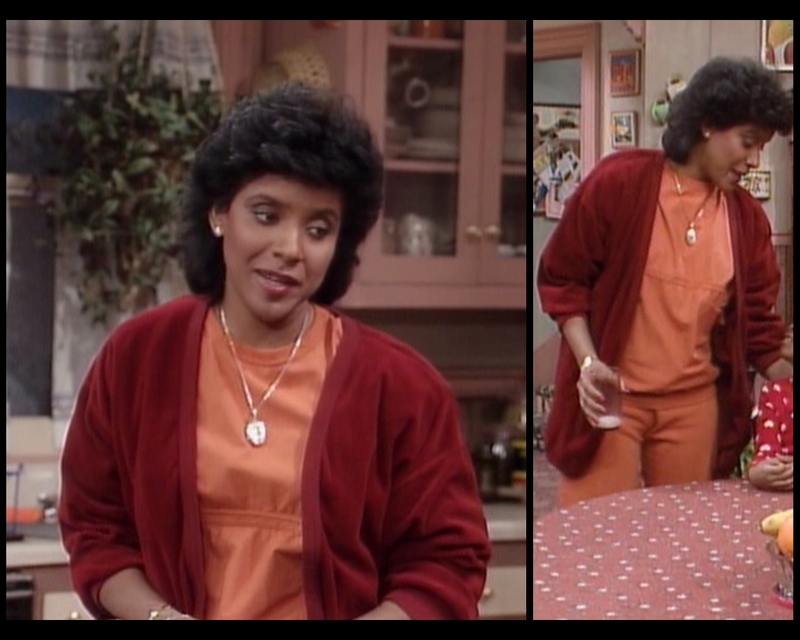 That's not a theoretical thought bubble; that's my actual process in looking at this smock of hers. I'm not really feeling the poncho vibe. 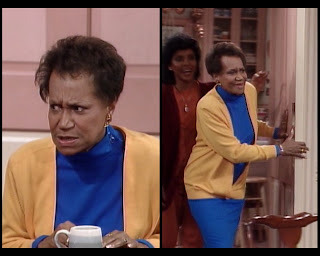 But moving from the many shades of jade in the necklace to the corals and pinks of her top to the soft gold in her pants, she's got this incredible color story going on. It'd all blend into itself if she didn't have the structured black divisions, too, so in that sense she's planned her impact impeccably. She's done a lot of good here. The asymmetrical nature of the shirt is fabulous, no? You weren't expecting that, were you? The gloves, though, might be misplaced. There's something glaring about pure white next to all those creams and peaches and pinks. It's the wrong time for that particular flourish. Not to be outdone by her mother's foray into volume, Denise gets fully geometric with her top. It is boxy as hell. Truth be told, I hate it, but I love her for using formal occasions as a chance to cart out the innovation. It's as though she sees existing norms as a personal challenge. Pretty much everything about this black rectangular thing bothers me, though: the shape is too much, the silver-on-black scheme is too stark, the lines and circles are like something out of a school project... it's possible that she made this, because the creativity isn't matched by sophistication. If this is intended to look a little unpolished, then bravo to the costuming team. But I'd like to see her a little more pulled together next time. Below the waist, she's much better off. Her skirt is sort of a sarong, with pants that we'll look at later. But it's a nicer world down there. Maybe I'm just more conventional in my expectations. Denise would be disappointed in me. This is one of the only shots where we can clearly see the Keith Haring-esque leggings she's wearing underneath the skirt. I wouldn't necessarily appreciate them in all cases, but I think they add something unique when the goal is to be dressy. 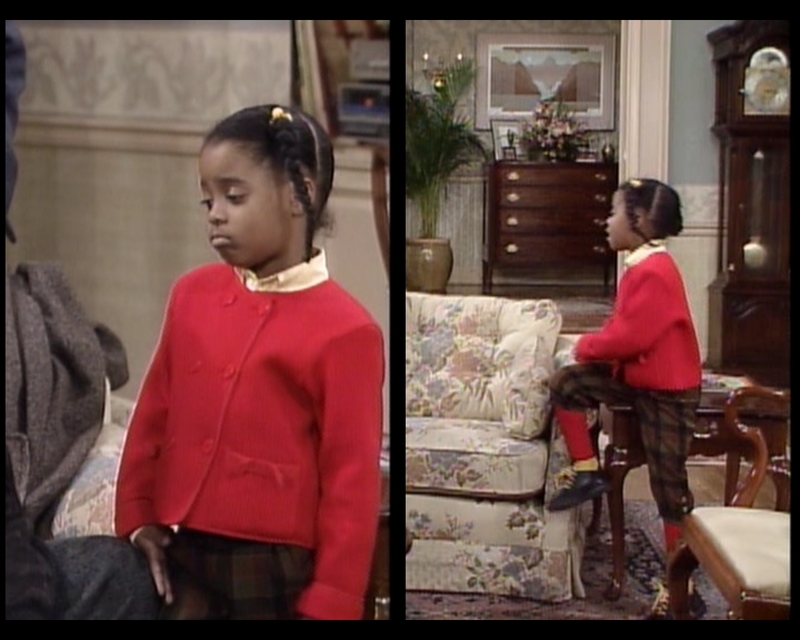 Since Vanessa is sitting there, I'll break from my usual oldest-to-youngest structure and jump straight to her. I guess Southwestern was a dominant aesthetic in mid-80s fashion, because Vanessa has hopped on the bandwagon full-force with this mulberry ho-down dress. It was tough to capture it completely, but you can see that it's not only large, but made of a stiff, heavy fabric. She might be able to survive a knife attack in something this tough. This is an outfit for square dancing and plowing a field. 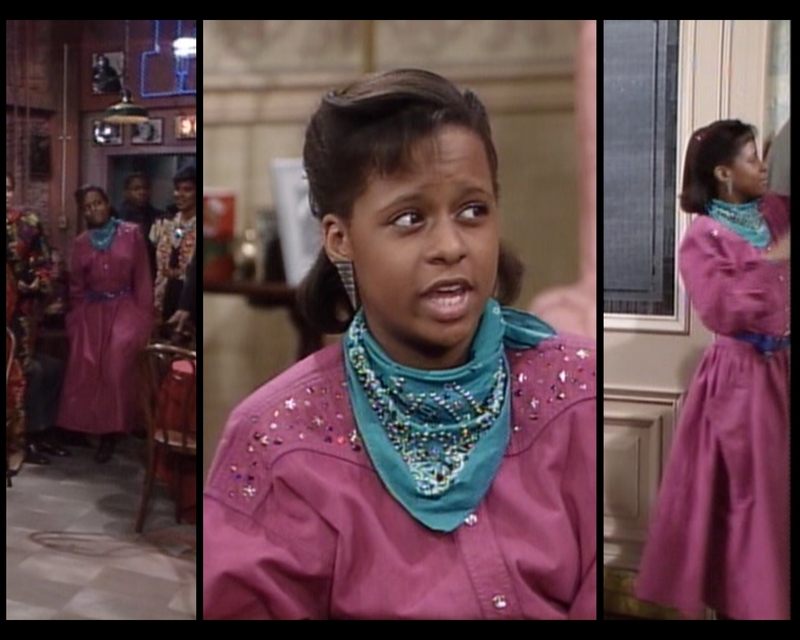 The palette and spangles take it out of the barn and into Brooklyn, and the earrings are actually a little awesome, but it's tough to to find much that I enjoy about her choices here. Maybe the belt, if we ever got a good look at it. She's generally smart about her belts. Come toward the light, Theo. 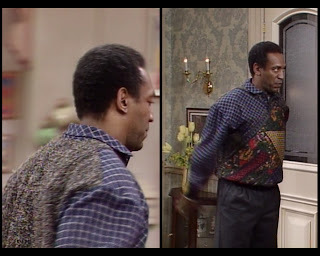 I told you Theo's shirt from last episode could work. 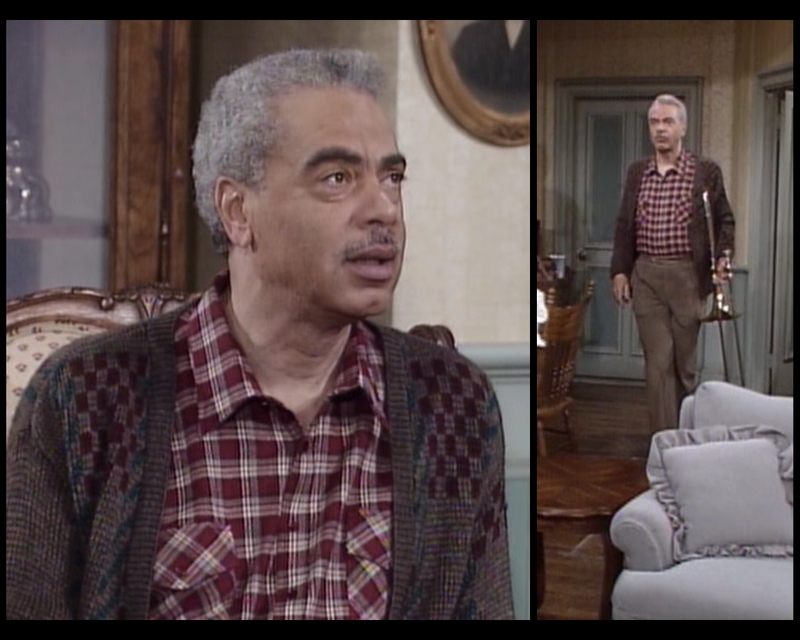 (This has got to be that same shirt, right?) 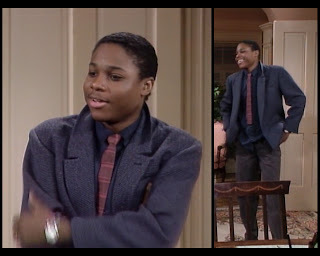 This blazer is an old standby for him, but again, that's as it should be, because real teenagers don't have closets full of dress clothes. The tie is a good contrasting color, but it's too short, and the squared-off end doesn't happen anymore. Also, there's too much dark; he could stand to incorporate some catchier hues. And tuck in your shirt, young man! You weren't raised in a barn. I hope you're wearing a belt under there. This still isn't up to Theo's usual standards, even if it's not as bad as it has been. I guess I'm not done worrying about him yet. We'll end with Rudy, who has somehow managed to merge the best aspects of Oliver Twist and Sarah Palin into a viable ensemble. I'll give this two thumbs up. Oh, and while you're grinning at the cute kid, don't forget to give me money. Thanks, y'all. But seriously, a donation of a dollar helps keep this site running. I'm committed to continuing this blog whether or not I break even, but a buck here and there over the course of my three year journey into the Huxtable family's closets would certainly be appreciated. Donors will receive a personal thank you note. (I'm still trying to think of something else I could give you that would make the money seem worthwhile. 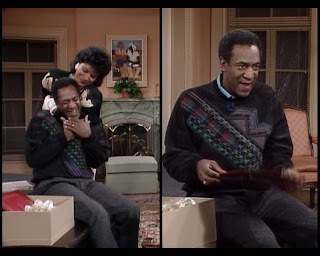 Maybe a picture of me, smiling, in a Cosby sweater. 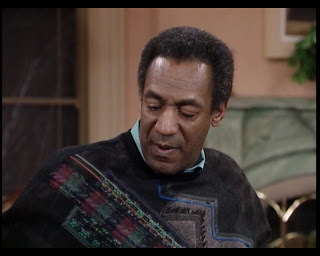 But I don't own a Cosby sweater.) Anyhow, the button is below. Press it if you feel so inclined. Otherwise, see you next Monday at 8:00am with a new entry. I'm always amazed at your ability to remember items of clothing from previous appearances. 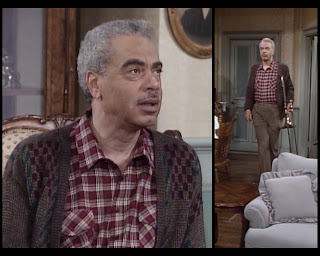 Do you have a database, cross referencing all known apparel with family members and the episodes they appeared in... or do you have an incredible memory? Some of it is memory, and some of it just the commitment it takes to go through all my previous screencaps in search of a particular garment. My next step, when I have some free time, is to make a database so I can do the searching more easily. Pretty soon, it's going to be too big a job to go through all the past episodes every time I think I've seen a garment before.